adAge obtained an “internal Google document” that disclosed the first half of 2010 AdWords advertising spend of Google’s customers. As you can imagine, the numbers of pretty revealing. 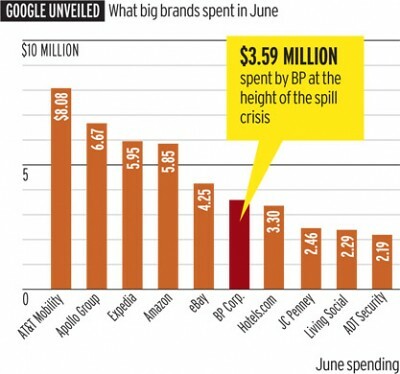 AT&T spent over $8 million in June, Expedia almost $6 million, Amazon $5.85 million and eBay $4.25 million. eBay is an interesting number to me, because there were rumors it was more like $26 million per month, we do know eBay did slow down some of their Google ads for a while. The document also shows how BP, who spent $57,000 a month is now spending $3.6 million per month. Yes, BP has been using search ads to help their image with the oil spill, but the amount they spent makes me wonder if Google turned the other way when they were violating the AdWords terms or if it was indeed just an error? 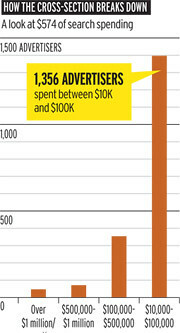 There are many revealing data points here, so check out the adAge article for more information.